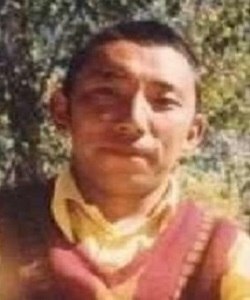 Thardhod Gyaltsen, a chant leader and senior monk from Drongna monastery in Driru county, was arrested in December 2013. He was accused of possessing images of the Dalai Lama and recordings of his speeches and teachings. He was sentenced to 18 years of imprisonment in January 2014. He is believed to be imprisoned in Chushul prison but this has not been confirmed. Like many other political prisoners in Tibet, Thardhod Gyaltsen is being held incommunicado, with no information about his health or detention conditions. Thardhod Gyaltsen is part of Free Tibet's In The Dark campaign, which aims to find disappeared Tibetans and work for their release. We are working on the cases of eight political prisoners held by the Chinese authorities, all of whom remain cut off from the world with little or no information about their location or current condition. Urge China to release them and respect human rights! We are contacting you to raise the case of Thardhod Gyaltsen [塔堆坚赞, Tadui Jianzan] and to urge you to take all measures within your power to reveal his current location and guarantee his immediate release. Thardhod Gyaltsen is a monk from Drongna Monastery, in Driru County. He was arrested during a police raid on his monastery in 2013 and has not been seen since he was sentenced to 18 years in prison in 2014. The state has provided no evidence that Thardhod Gyaltsen’s conviction was based upon due legal process or principles of justice established in international law. Authorities do not appear to have released the reason for Thardhod Gyaltsen’s arrest and conviction, but they are reportedly based on his alleged possession of pictures and recordings of the Dalai Lama. To arrest Thardhod Gyaltsen on this basis is a violation of his rights under international law to freedom of expression and freedom to receive and impart information. As you know, Article 35 of the Chinese constitution guarantees freedom of speech, assembly, association, procession and demonstration, while Article 36 guarantees religious freedom. For these reasons, Thardhod Gyaltsen must be promptly and unconditionally released. Although our information indicates that he is in Chusul Prison, Thardhod Gyaltsen’s location has not been confirmed, nor has his current condition in prison. This raises concerns that Thardhod Gyaltsen is at risk of torture or other forms of ill-treatment.